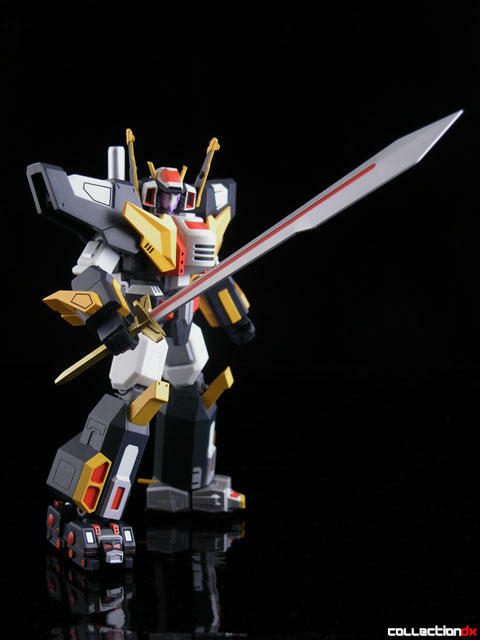 Dancouga Nova comes from the revamped Dancouga series entitled "Juso Kiko Dancouga Nova" (獣装機攻ダンクーガ ノヴァ). This 12 episode TV anime aired in Japan in early 2007. 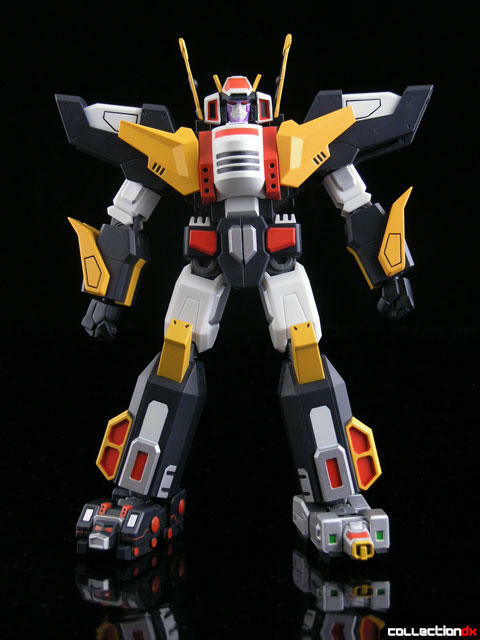 The design is obviously meant to be an upgrade from the original Dancouga. Originally, CM's had planned to do a large diecast transforming version of this, but cost and lack of interest canceled it. Now, here it is in a more accessible format - the GN-U Dou Dancouga Nova. 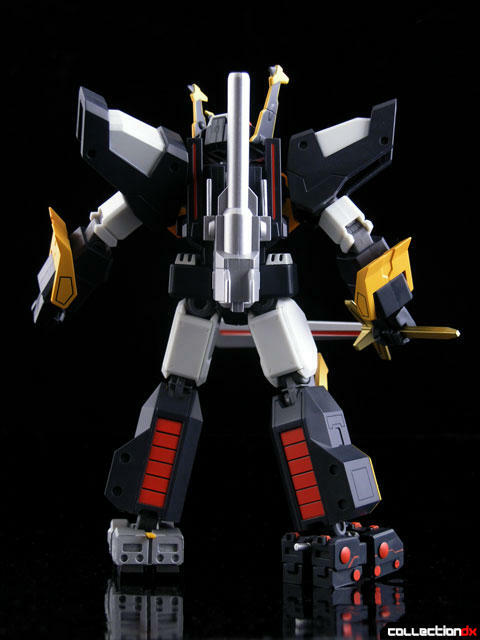 The Dancouga Nova uses the standard GN-U DOU frame and thus is about the same size as all of the others in the line. Constructed of high-quality POM, ABS and PCV plastic, the toy feels indestructible. That's not to say parts wont fall off, but that they wont BREAK off. We know the good of the GNU series. High quality, attention to detail, sharp sculpts. But we also know the flaws - lack of accessories, parts that fall off easily, tough to switch hands. Dancouga is no different. He looks great and poses great, but some parts fall off if you look at them the wrong way. The most notable offenders are the small waist skirt peices and the large yellow wings on the chest. Sure, they snap right back on, but you wish you didn't have to. 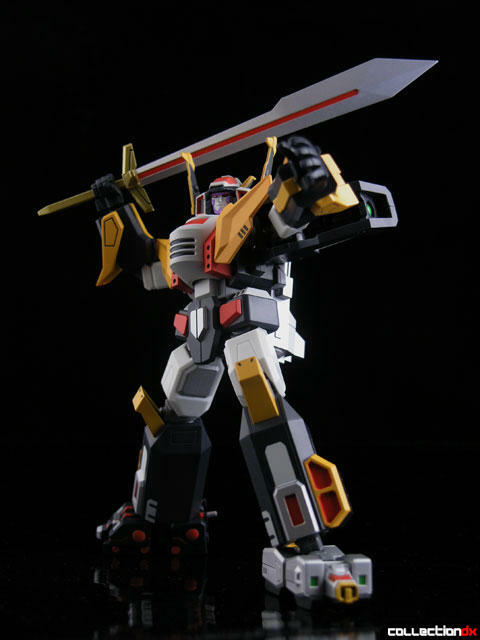 Accessories include a giant sword, 2 extra hands, and a large back cannon. 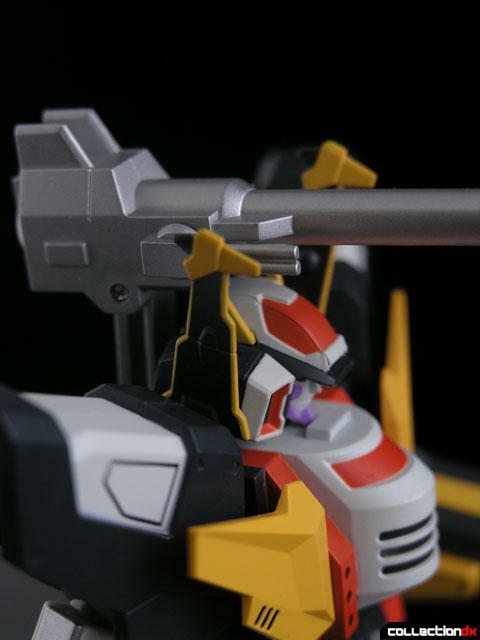 The cannon plugs into the back and can be positioned over the head. The small cannons on the side move as well. Unfortunately, the joints in this cannon are so tight, each time you try to position it, the cannon comes right off the back. What I do is position it first, and THEN put it on the back. Despite all that, Dancouga Nova looks great on the shelf, and I had a really fun time photographing him. I think these may be some of the best pictures I've taken. He's very photogenic. No wonder They didn't think they could put out a full size. I don't know what the Japanese reaction was like (don't read the language) but Americans HATED this show for some reason. Not having seen it,I wouldn't know,but it's probably due to it being a remake of a classic. I keep meaning to give it a viewing though. I liked Gravion,and that was by the same people. As far as the toy,Revoltechs exploited a need most people didn't know was there-small,articulated,show accurate mecha figures that don't take up too much space per figure and don't break your bank account. That said,they filled that need PERFECTLY. These GNU-DOU figures,or really any future Revoltech competitors,really have a lot to live up to,since Revoltech did it first,and IMO at least,did it best. I'll be surprised if someone comes along with better figures in that size/pricepoint. Let's be fair and give everyone his due. 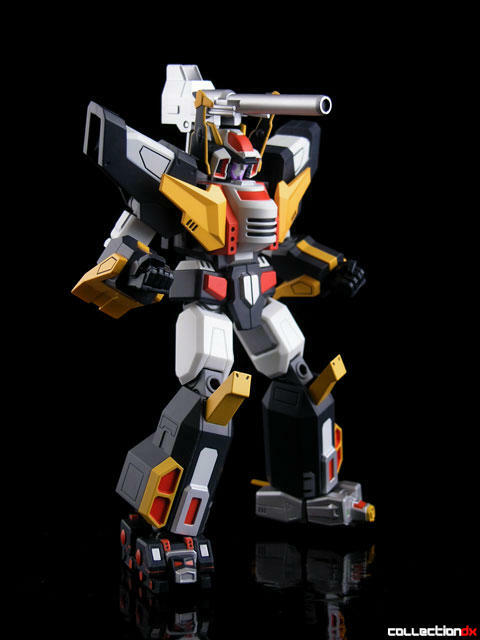 The first mecha sculpted in mouthwatering cool poses were the resin garage kits sculpted by the great Hayami Hitoshi-sensei in the SUPER 3D SHOW series but they were somewhat expensive and were modells designed for professional modellers. Need less to say I bought them all!!! Then came the Revoltechs. 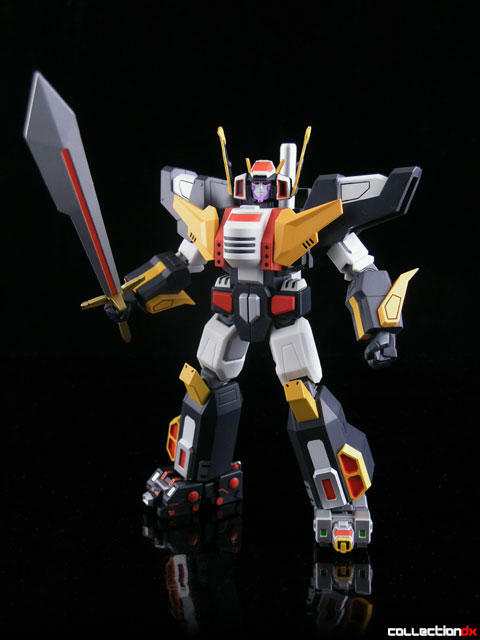 Anime accurate, cheap, do not take much space, easily collectible. I bought only those that interest me badly. Then came the GN-U DOUs. And here I got what I have always wanted namely anime accurate, quite cheap, do not take much space, accessories kept to a minimum, easily collectible and for the first time in history with an extreme attention to paint scheme which is done by perfectionists for perfectionists!!!!! As Yamato itself admits these are not action figures but action models which, I feel, explains the lack of accessories as the robots are not meant to be played with but to be displayed like statues. Of course Yamato gives you the option to decide which pose to give to your model. Personally, I like their Bryger and Baldios best. 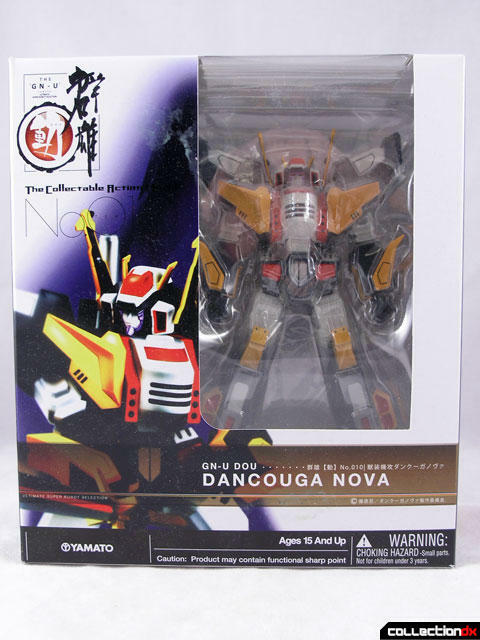 CM's still plan to release a diecast Dancouga Nova. However it does not transform. That just seems kind of cheap to me. I mean,I know why this little figure doesn't seperate,but a big old metal one really should. 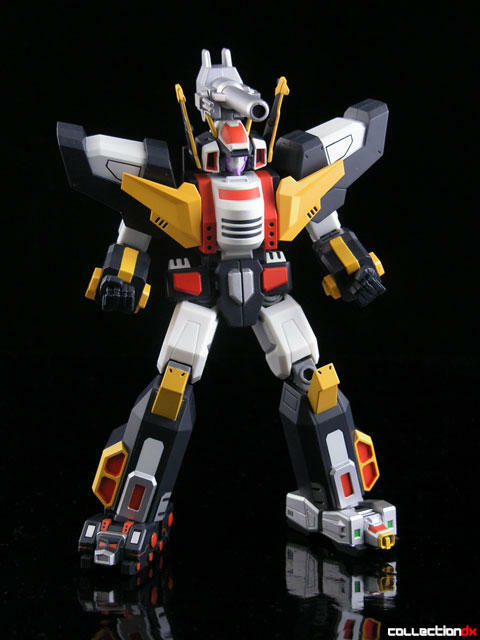 I know it's an unpopular mecha,but making it non-gattai isn't going to make it more popular. Even if it results in a lower price,the people that dislike the show or the mech are just going to spend their money elsewhere. Great photos Josh! Are you shooting on a black background or are you replacing the background in Photoshop? Also on the drop shadow, is that what you are shooting on or are you adding it in PS? Great photos! Everytime you try to pose this thing something falls off. Bend the leg too much the shin falls out. Raise the arms too much, chest parts fall off. The ears on mine broke off the first time I touched them. Cheap glue. I like the character but wish they did it w/o using a poseable skeleton, if you take all the dancouga parts off! I saw the first episode of NOVA-It was boring and felt rushed. This version of Dancouga feels too much like Gravion. Despite that, there's just something about it that I like. And from some of the pictures I saw off site: He dose look good posed next to the original Dancouga.